It’s not that I have not wanted to blog. Especially about my amazing birthday, how I saw my old Senior Boat Dance date Dax last night, how a total stranger on the street came up to me and asked “Oh my god, are you Kristina Wong?” etc. I haven’t been intentionally ignoring my blog. It’s just that there’s nowhere in Manhattan to sit down to blog thoughtfully. And when I finally find a place to sit down, a real place to sit down, not a corporate building planter with spikes around the side so nobody can sit on it, there’s a flood of emails about this or that crap. And I’ve been carrying around all this crap. And I’m tired. And I’m cranky because there is nowhere to sit down and I have to carry all this crap around. I have a theory that people in NY are not depressed. Because depressed people sit around and lie down a lot. The blood inside the body of a depressed person moves slowly and slothlike. People in LA are depressed, because they sit around a lot, and are able to go weeks without seeing more than 5 people. Not so in NYC. Where you see thousands of people by the time you finish breakfast. And your blood is always racing around. Ugh. I need to crawl back to the apartment and nap. I have pictures coming. I swear. Marjorie comes into NYC tonight. I’ve hired her as my community outreach coordinator. Hopefully her help in outreach will alleviate this anger. This stress. And not heighten it. I just have to put on a good show. It’s so hard when there’s so many other things to think about. Did I ever mention how hard it is to run, steer, finance and entertain this cruise ship named “Kristina Wong” alone? Looking for a good kind soul…. 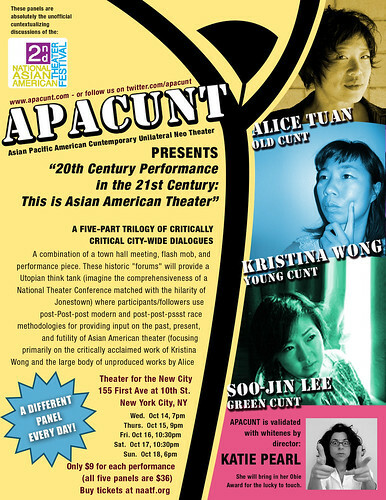 Oh yes, in other news, I’m trying to find a ticket sponsor so that 16 kids from the Chinatown Youth Initiative can see my show for free. This program would allow these kids some early exposure to the theater, and mys how and the themes it brings up. They’ve decided somehow that my show would be perfect for their kids to see but they cannot afford to come nor pay for tickets. Unfortunately, the tickets cost me $320 to give as comps. Yes, with this particular show, I eat the cost of every unpaid ticket. Would anyone like to buy these tickets for them so they can see the show? Do it for the kids! Please! Ok, onward to my nap. Category: goddamn new york makes me angry.